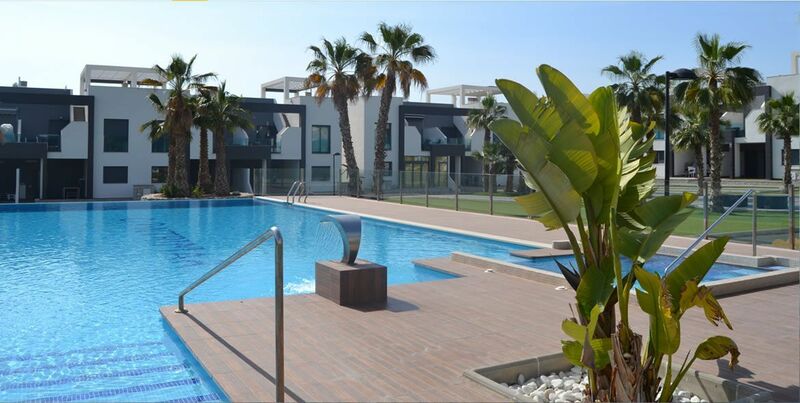 This new complex of 31 detached villas, with a modern design and a quality finish, is situated in Lomas de Cabo Roig, just 2.5km from the local sandy beaches. With plots ranging from 179m2 up to 355m2, each villa has its own garden with a private swimming pool and parking within the enclosed plot. All villas have three bedrooms and three bathrooms, and are distributed over three floors. On the ground floor you will find a large living/dining area with an American style kitchen, a bedroom and a bathroom. The large windows let lots of natural light in and from the living room you have access to the large terrace and the pool area. On the first floor you will find two further bedrooms, both with en-suite bathrooms. One of the bedrooms also has a balcony. There are two terraces on this floor accessible from the landing. The top floor has a roof top solarium with nice sea views. The basement can be available at an additional cost. Features included in the price of these villas are: an automated car gate, double glazing, security front door, intercom access, pre-installation for air-conditioning and fitted wardrobes in the bedrooms. 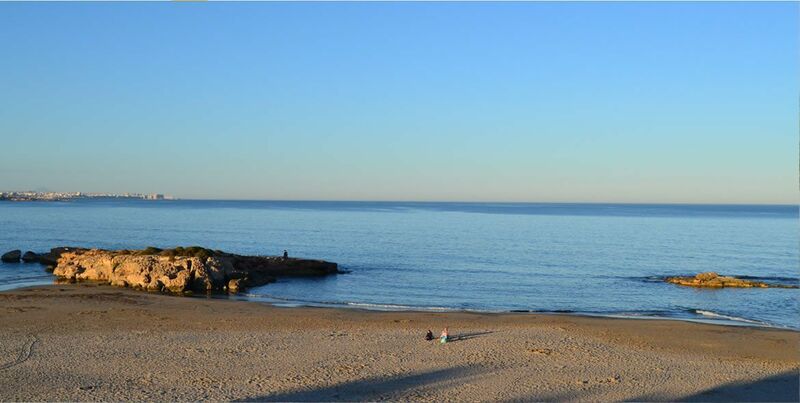 These properties are located in the area of Lomas de Cabo Roig in the Orihuela Costa, with access to two nearby airports, Alicante and Murcia, at 45 and 20 minutes away respectively. The villas are very well situated as they are 5 minutes away from the beaches of La Zenia, Cabo Roig and Campoamor and less than 10 minutes away from 3 golf courses. They are also only 5 minutes away from the biggest and the most visited shopping centre in Spain, Zenia Boulevard and within walking distance to bars, restaurants, shops, a supermarket and a soon-to-be-built local shopping centre. 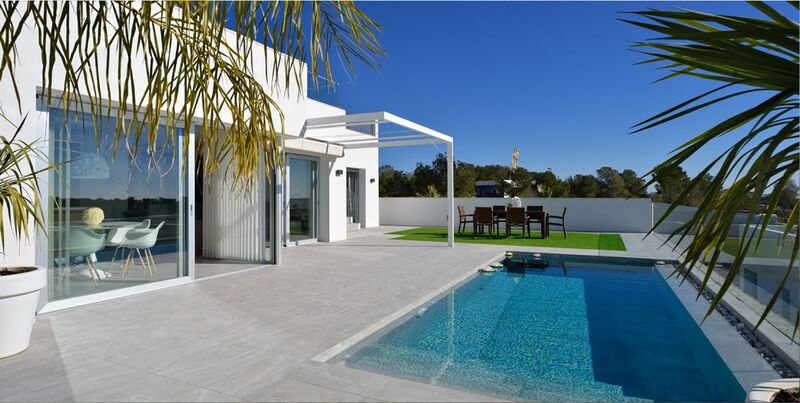 This new complex of 16 detached villas, with a modern design and a quality finish, is situated in Lomas de Cabo Roig, just 2.5km from the local sandy beaches. With plots ranging from 185m2 up to 305m2, each villa has its own garden with a private swimming pool and parking within the enclosed plot. All villas have three bedrooms and three bathrooms, and are distributed over three floors. On the ground floor you will find a large living/dining area with an American style kitchen, a bedroom and a bathroom. The large windows let lots of natural light in and from the living room you have access to the large terrace and the pool area. On the first floor you will find two further bedrooms and two bathrooms, one of which is en-suite to the master bedroom. The top floor has a solarium with great sea views. The basement can be available at an additional cost. Features included in the price of these villas are: a landscaped garden with artificial grass, a security front door, double glazing, an intercom access, motorized blinds, pre-installation for air-conditioning, and fitted wardrobes in the bedrooms. 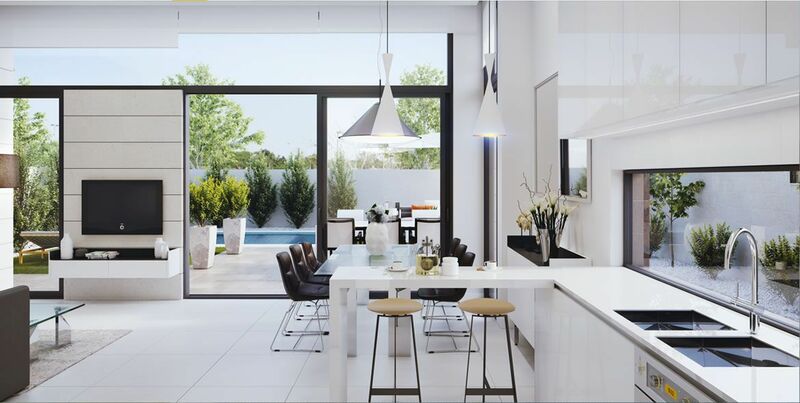 Stunning individual villas with a modern design and a quality finish situated in Lomas de Cabo Roig, at only 2.5km from the local sandy beaches. With plots ranging from 201m2 up to 289m2, each villa has its own garden with a PRIVATE SALT WATER SWIMMING POOL of and parking within the enclosed plot. These villas are built over three floors, including the roof top solarium and have three bedrooms and three bathrooms. On the ground floor you will find a large living/dining area with an open plan kitchen, a bedroom and a bathroom. The large windows let lots of natural light into the villa and from the kitchen and living room you have access to the large terrace and the pool area. On the first floor you will find two more bedrooms, both with a en-suite bathrooms and access to the terrace. The top floor has a roof top solarium with stunning views to the surrounding area. Standard features include landscaped garden with artificial grass, exterior non-slip tiling, a security front door, intercom access, double glazing, electric shutters, shower screens in the bathrooms, fitted wardrobes in the bedrooms, installation for air conditioning, pre-installation of an alarm, and fitted kitchen with ceramic hob, oven, dish washer, fridge freezer, extractor, microwave and a wine cooler. The basement can be available at an additional cost. The villas are within walking distance to supermarkets, bars and restaurants. Only a short drive away you will find the famous shopping center “Zenia Boulevard” and several well-known golf courses including Villamartin, Las Colinas, Las Ramblas and Campoamor with many more not too far away. 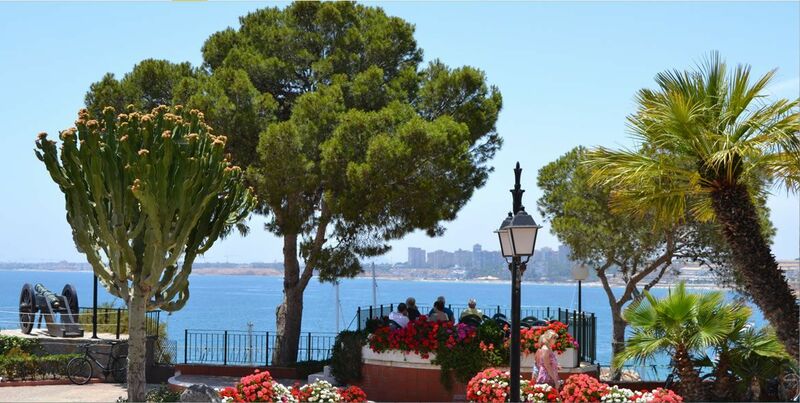 The two international airports of Alicante and Murcia are located at a comfortable driving distance, 45 and 25 minutes respectively. 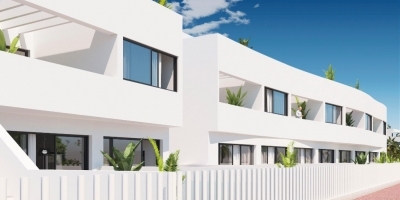 This new complex of 32 detached villas, with a modern design and a quality finish, is situated in Lomas de Cabo Roig, at just 2.5km from the local sandy beaches. With plots ranging from 176m2 up to 342m2, each villa has its own garden with a private swimming pool and parking within the enclosed plot. All villas have three bedrooms and three bathrooms, and are distributed over four floors. On the ground floor you will find a large living/dining area with an open plan kitchen, a bedroom with an en-suite bathroom and dressing room, as well as a toilet and a utility room. The large windows let lots of natural light in and from the kitchen and living room you have access to the large terrace and the pool area. On the first floor you will find two further bedrooms, both with their own bathroom and terrace. The top floor has a solarium with great sea views. These villas also have a 85m2 basement with the possibility to make an extra bedroom, kitchen and living room at an additional cost. Features included in the price of these villas are: a landscaped garden with aritifical grass, a security front door, double glazing, an intercom access, motorized blinds, spotlights, pre-installation for air-conditioning, and fitted wardrobes in the bedrooms. These properties are located in the area of Lomas de Cabo Roig in the Orihuela Costa with access to two nearby airports, Alicante and Murcia, at 45 and 20 minutes away respectively. The villas are very well situated as they are 5 minutes away from the beaches of La Zenia, Cabo Roig and Campoamor and less than 10 minutes away from 3 golf courses. They are also 5 minutes away from the biggest and the most visited shopping centre in Spain, Zenia Boulevard, and within walking distance to bars, restaurants, shops, a supermarket and a soon-to-be-built local shopping centre. CHRISTMAS OFFER! 10.000€ in furniture (white goods, air conditioning, basic pack lighting) Contact us for more information. 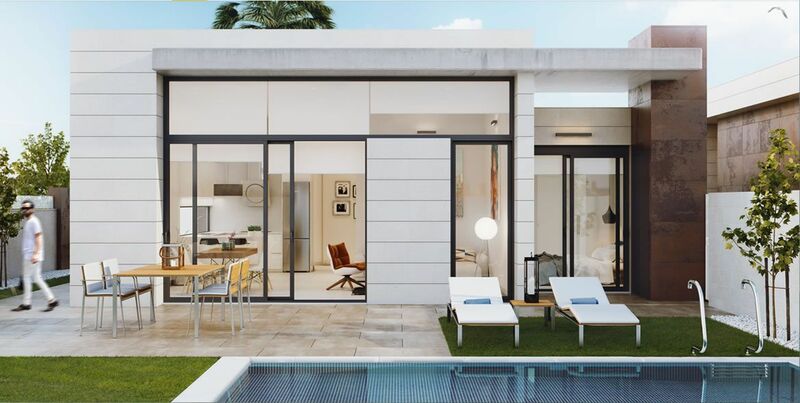 Stunning individual villas with a modern design and a quality finish situated in Lomas de Cabo Roig, at only 2.5km from the local sandy beaches. With plots ranging from 201m2 up to 289m2, each villa has its own garden with a private swimming pool and parking within the enclosed plot. These villas are built over three floors, including the roof top solarium and have three bedrooms and three bathrooms. On the ground floor you will find a large living/dining area with an open plan kitchen, a bedroom and a bathroom. The big windows give lots of natural light inside the villa and from the kitchen and living room you have access to the large terrace and the pool area. On the first floor you will find two more bedrooms, both with a en-suite bathrooms. One of the bedrooms also has direct access to the balcony. The top floor has a roof top solarium with stunning views to the surrounding area. Standard features include landscaped garden with artificial grass, exterior non-slip tiling, security front door, intercom access, double glazing, electric shutters, shower screens in the bathrooms, fitted wardrobes in the bedrooms, installation for air conditioning, pre-installation of alarm, and fitted kitchen with ceramic hob, oven, dish washer, fridge freezer, extractor, microwave and a wine cooler. The basement can be available at an additional cost. The villas are within walking distance to supermarkets, bars and restaurants. Only a short drive away you will find the famous shopping center “Zenia Boulevard” and several well-known golf courses including Villamartin, Las Colinas, Las Ramblas and Campoamor with many more not too much further away. The two international airports of Alicante and Murcia are located at a comfortable driving distance, 45 and 25 minutes respectively. Now that the new build construction has resurfaced in Spain, one of the formulas that also returns and with which we can lower the price of our new home, is the purchase of off plan. In this article we give you advice so that nothing fails. The latest data on housing indicates that new housing is back, especially in the coastal and tourist areas of the Mediterranean Coast. The increase in visas in construction, and even the increase in the average price of new housing signifies a new time for this sector, after a few forgotten years. Now that you are going to find these types of promotions again, if you are thinking about buying a home, it is good to have a few tips. Collect information about the builder and his career. Who is the builder,who is selling you the house? Have they had problems in the past? It is advisable to know if they have experience in the sector, review data on its solvency or to find out if it is the owner of the land on which it is going to build the houses. Make sure you understand all the clauses of the contract of sale. You should read carefully the private contract you are signing. Look at all the clauses it contains and try to ask or get advice on everything you do not understand. The contract is not usually carried before a notary until the delivery of keys. Get your copy of the plans. It will be your way of demonstrating any change or breach of the builder's work. You can request them at the time of signing the contract of sale. Are the price and date correct? Remember that the documentation provided by the builder must include the final price of the property, including VAT, as well as the date on which the keys will be delivered. Always pay through your bank. The current legislation obliges the developer to have a current account that can only be used for building expenses. In this account is where you must make the payment by bank transfer, so that it is adequately registrated. Ask for an endorsement to the promotion and an individual one. You must demand that a general guarantee be created for all the promotion that guarantees all the amounts contributed by the owners. In addition, you should demand an individual guarantee guaranteed by an insurer or a bank. In this way you will be entitled to compensation if something happens that will allow you to recover the money contributed. 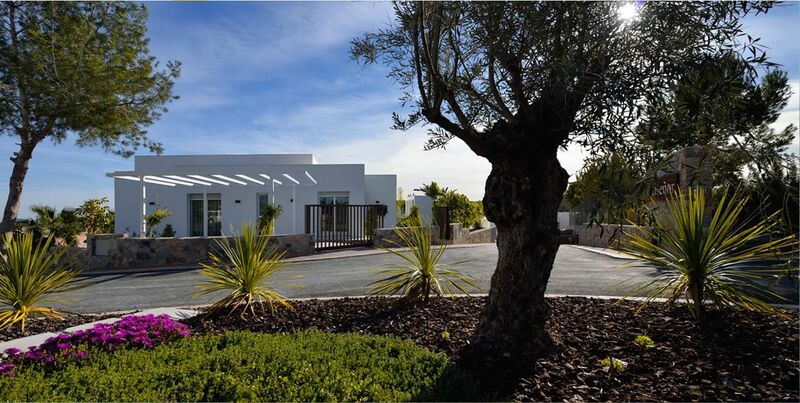 Golf Sun Spanish Properties offers you new build property for sale in Lomas de Cabo Roig. In Golf Sun Spanish Properties from the first contact, we offer a quality service taking care of at all times of the client throughout the process of purchase and after sale. Our real estate agent specializes in new construction housing in Orihuela Costa, Costa Blanca and Costa Calida. In our online catalogue you can find both key ready and off plan homes. Get in touch with us today. You can call us by phone, write us an email, fill out the web form or visit us at our offices in La Regia.